Having a comfortable working environment helps to maintain happiness within the work place. Whether you work from home, or in an office, it is important that you have the right furniture that offers you support. As a blogger I can spend many hours sat in my home office, so it is really important that I have a chair that is comfortable, and it is also very important to have comfortable office chairs in the shared working space too. 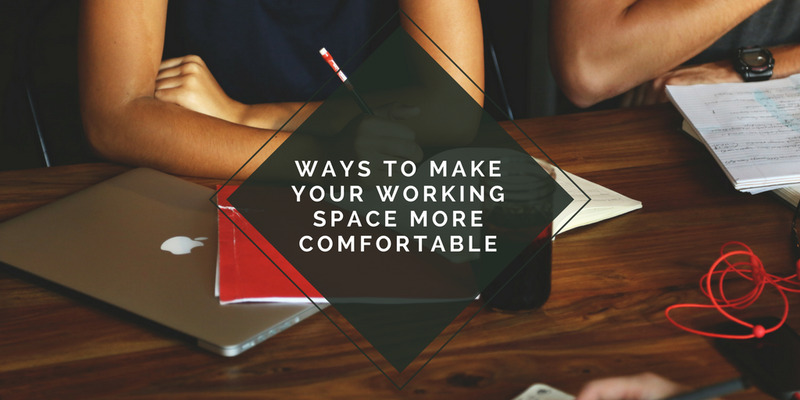 Today I thought I would share some ways you can make your office space a bit more comfortable, whether your office is at home or in a shared working space. When it comes to picking a desk, it is important that you pick one that is functional. It is handy to have plenty of office storage, and one way you can do this is to have a desk that comes with drawers. In an office, an added bonus is having drawers which lock as this means that you can keep your personal belongs safe whilst you are away from your desk. There are many types of desk to use. I use a basic Ikea desk but I have added some of my own storage through metal drawers and letter trays. I would love something a bit nicer and more functional but at the moment the Ikea desk offers me more space. I'd love one of the executive office desks in the future that you can find on sites like Calibre Furniture. Calibre Furniture are modern office furniture suppliers who are experts in sourcing the highest quality contemporary furniture for a wide range of office spaces. Office storage is really important, especially when it comes to space to file documents. Even working from home I have countless amounts of paperwork to keep. I have to keep track of all my expenses and income, so I need plenty of space to store these documents. I do keep them on my macbook, but I also like to have paper copies. I also run another business alongside my blog so I need even more storage to keep everything I need for that. I get sent products to test so I have lots of different storage baskets within my office to keep everything organised. I find that having a buddy to work with can actually help with my productivity. By having a buddy I of course mean having a dog to keep me company as opposed to a toddler running around. My dog brings me lots of joy, and so having her around makes my working environment just that little bit more joyous and takes the focus off the amount of work I need to get done. Having a dog in the office has been shown to improve productivity and the general mood. You can read more about how having a work dog/pet could help your work place on the Calibre office furniture blog. Whether it is a small family photo on your desk at work, or decorating an entire home office, it is important to add a personal touch. Looking at a photo of your loved ones during a stressful day at work could help you full through and get the work done. Creating a working environment that brings you joy is sure to increase your productivity and allow you to produce amazing work. I know that having my office just the way I like makes me want to use my office. It's the place I escape to! These are just a few of my tips. I'm no expert on creating the perfect work space and I can only give advice on what I do in my own home. If you would be interested in an office tour, please do let me know either in the comments or tweet me. THIS IS A SPONSORED POST IN COLLABORATION WITH CALIBRE OFFICE FURNITURE. THIS WEBSITE USES AFFILIATE LINKS. FOR MORE INFORMATION, PLEASE READ MY DISCLOSURE POLICY.